Pull ahead of those ever growing weeds. 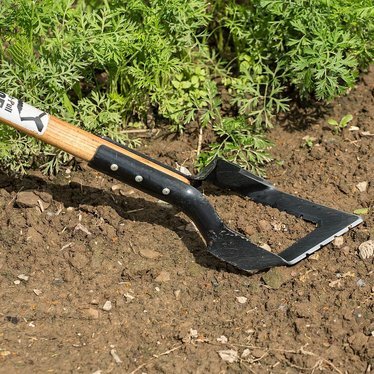 Using a push and pull motion, the sharp, serrated edges of the "v" blade helps you to cut down weeds easier than a traditional hoe. 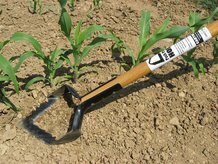 For this reason, the push pull hoe is perfect for cultivating gardens. Use the point to dig out those deeply rooted weeds. My hands no longer allow me to pull weeds and this tool is excellent for getting them out by the roots. Given the craftsmanship it is well worth the price. Made in America is always the best buy. I am a 64 year old female that loves flower gardening. Our house backs up to a natural wetland that provides us with a beautiful natural setting. Unfortunately it's this same setting that provides thistle, spurge and Lord only knows what other types of weeds and invasive vines that creep into my garden beds. Not being as flexible as I once was my back prevented me this year from having the best looking beds that I'm accustomed to. I purchased this tool after having read the reviews...especially from Mr. Arthritis. I decided that today was the day for a season long of weeds to be removed and removed there are...effortlessly! I can't wait until next year when I'll be able to have weed free garden beds again. If your on the fence about which tool to invest in, I would highly recommend you put this one at the top of your list. If I can do it, so can you. My husband likes this way better than a hoe. He says it undercuts the weeds and does a better job at getting the root. He not only used it in the garden, but took it into his soybean field to get rid of the invasive palmer amaranth weed that he is fighting to keep out of our fields. We also took it to the lake to help destroy the few weeds that we get in our sand. Good lightweight tool for home gardeners . Was expecting a much heavier , commercial type tool. Mr. Arthritis hates this hoe BUT I love it! The older I get the more I like to garden but the less my body wants to cooperate. Old Arthur just won't leave me alone. I've tried many kinds of hoes but I'm here to tell 'ya that this hoe is right on the money. The weeds don't stand a chance. I ain't sayin' it's perfect cause this hoe won't work itself. But, I will say it's the best hoe I've had yet. It's a little pricey but then again - I ain't grabbin' my back and doubled over in pain and to my way of thinkin' that makes this hoe worth every penny. This is THE best weeding tool I have used. Far outdoes the typical stirrup hoe I prevously used. Cuts almost effortlessly through weeds and soil. I highly recommend this tool for anyone who dislikes weeding as much as I do! This works perfect so you will not have to bend over and pull weeds! Just what I was looking for! It's very well made too! This is one of the best garden tools I have ever owned! Lightweight, versatile and takes care of weeds quickly and easily! 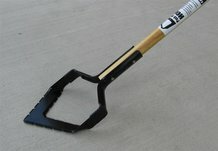 My dad had one of these that he got from his mom.This is without a doubt the best tool for gardening ever made.I have been searching for one of these for 30 or more years.I can't wait for them to come in. I had been looking for this tool for almost 50 years, my mother had one and I wanted one and have looked all over and could never find one. I am delighted to have finally found it. It is the best weeding tool ever designed it slices through weeds/grass like a hot knife through cold butter it is just GREAT.Thanks Lehman's for selling it. You can also use it to make rows in your garden. Still have my grandmother's hoe , best hoe ever. I have been looking for this garden tool for 40 years. Grandpa used one all of the time. Thank you for offering this tool. It is a time trusted hoe.